Scratchcards are well known as one of the highest profit fundraising products, making up to 90% profit. They are successful for schools, churches, teams, or any group that wants to earn funds fast. Supporters scratch off circles to reveal what they will donate. In return, they receive a sheet of coupons. It’s a win, win! Each card cost $20 and earns $100 if all dots are scratched. Plus, you get 10% free cards for every 10 that you order, which gives you even more profit. Plus, you get free shipping. And, it’s easy and fun. If you haven’t tried these already, now is the time. FREE SHIPPING! with minimum order. We recommend purchasing 1 scratchcard per participant. What Are Scratchcards for Fundraising? Each Scratchcard has 3 flaps that fold into a 4″ by 6″ card. Each card has 30 scratch dots. The card also includes 30 coupon sheets to reward supporters for their donation. It’s very compact and easy to carry in a pocket or purse. Your cards will always include the name of your group on the front cover. 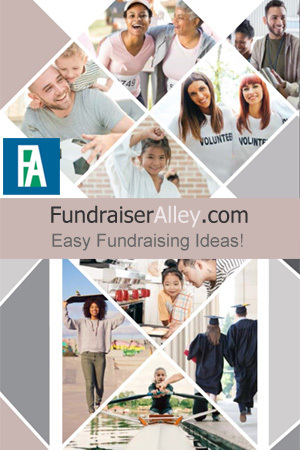 There are lots of different Themed Covers to match your organization, so whatever your group type (sports team, school group, church, dance, band, general), you are sure to find the right fundraising card for you. You can also choose Custom Scratchcards and have a photo of your own team or group on the front cover. Scratchcards can earn up to 90% profit for your school, club, group, church or sports team! Each card will earn $100 if all spots are scratched, yielding a 80% profit. Plus, you will receive 10% bonus cards with every 10 cards that you order, which equals to 90%! This is the highest profit fundraiser you will find anywhere. You will receive 10% FREE Bonus cards for every 10 cards you order. These cards will earn you more profit. 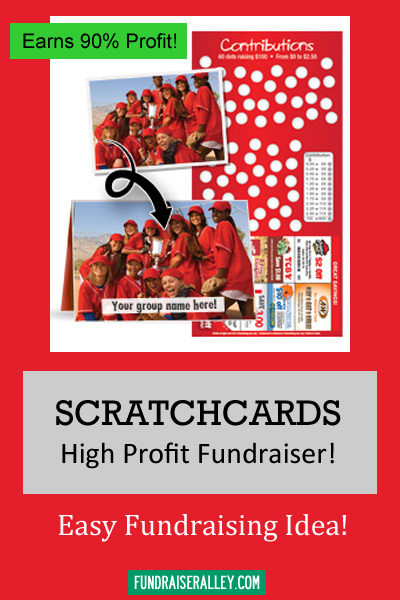 Scratchcards are a favorite fundraising idea for schools. Not only do they earn a high profit, but they are easy and fun to do. No worries about product storage or delivery. No worries about tallying up order totals or sending in orders. Simply order one scratchcard for each participant and hand them out after they arrive. When that participant has all of the circles on their card scratched, they turn in the money earned. And, that’s all it is to it!